Six officers race on all seven continents for the sake of helping others. 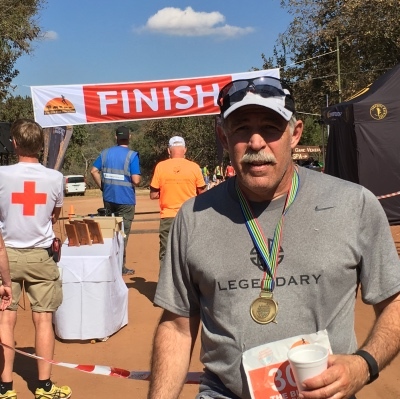 An experienced runner who’d traveled around the globe to race, Randy Pentis was used to seeing courses lined with gawking onlookers. But this? This was something else entirely. 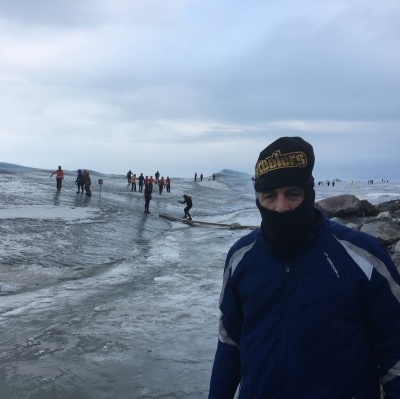 He was chugging along the frigid shore, kicking through pebbles and sand, pushing through horizontal snowfalls, with freezing waters lapping at his running shoes on one side and mountains of gray rock and blue-white ice towering over him on the other. Then he turned around a bend of rocky beach and saw them. They were waiting, watching, great hordes of them, seemingly tuxedo-clad, craning their necks and trying to puzzle out why this older man from California was huffing out lungfuls of steam as he chugged toward the 26-mile mark—on Antarctica. It wasn’t anything exotic that propelled him to the icy wastes of Antarctica. In fact, it all started just a few miles from home, at Children’s Hospital Los Angeles. Pentis’ youngest son, Anthony, was born with physical and neurological issues that made it difficult for him to walk. Around 10, Tony began treatment at CHLA, under the eyes of Robert Kay, MD, a pediatric orthopaedist who specializes in neuromuscular diseases. “Just like any other kid, Tony wanted to go out and play sports, but he couldn’t, because his nerves and muscles weren’t working right,” Kay says. “He’s got the heart of a lion, and he’s not walking,” Pentis says. Over the course of a decade, Tony underwent three surgeries and rehabilitation with Kay at CHLA. Though he still wears a leg brace, he improved so much that he ended up making his high school basketball team, and, now 30, is still deeply involved in sports. “My son’s six-foot-five, and he’s draining three-pointers, and the opposing team doesn’t even know what to do!” Pentis recalls, laughing. It’s not the surgeries that Pentis remembers most fondly of the years he and Tony spent working with Kay, though. It’s the talks they had. The sextet had already raised $3,000 for charity for the race they’d just run, impressive for a bunch of older guys in blue who’d never done anything like that before. And they wanted to do it again, to help the public regain some of the trust it had lost in U.S. law enforcement. “So we were six cops who didn’t know anything about marketing trying to figure out how to keep helping but to do something unique,” he says. “At the Javitz Center, now, they had [running event] vendors from every country in the world. Back then, we’d done races in Chicago and New York over a couple years, but I saw a guy there from Tunisia trying to get people to run a race there. “And they said, ‘What were you thinking?’” Pentis says, chuckling. Nevertheless, four months later, all six men were in North Africa, wiping sand and sweat from their eyes and plowing through full-on sandstorms in one of the hottest, driest places on the planet. “We’ve been friends for 100 years, so we just roll with each other,” he explains. After the race and on the way home, having raised yet more money for charity, the officers noticed all the people who’d been following their odyssey online. Many of them were asking where the next adventure was, and how they could send money to donate to their next cause. The officers knew they were on to something. So they made it official—on a bar napkin. In the more than a decade since, the band of brothers has raised money by running on all seven continents, visited 18 countries and run over 30 races. They’ve relived history on the Great Wall of China; suffered through 101-degree weather, 80 percent humidity and bribe-seeking officials in Myanmar; threaded the big heads on Easter Island; and braved subzero temperatures both at the North Pole and on Antarctica—and, of course, those quizzical penguins. 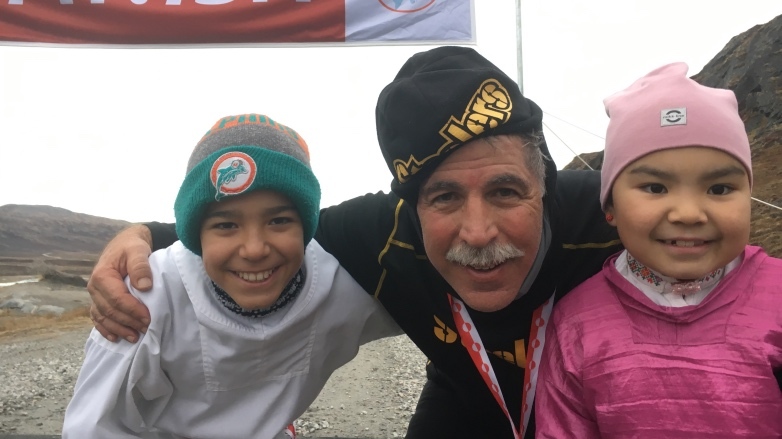 “The Pittsburgh Steelers gave us their cold-weather gear, and we were layered, so we were always very comfortable,” Pentis says. Still, those experiences actually paled in comparison to the risks in Iceland and Russia, though for very different reasons. In Siberia, they had to contend with attempted shakedowns from shady characters who let it be known they were from a Russian security agency. “When we got there, they said, ‘People don’t go to Siberia, we send them to Siberia,” Pentis remembers. But he also notes that every race has been worth it. For one, there’s the sense of exploration he and his friends got to share. “There’s the sheer beauty of the wild horses in Iceland in a land where you could fill your water bottles straight out of the streams and the finish line is the volcano that had just erupted a few years before,” he says. And then, of course, is the fulfillment they get from making the world a better place, long after they handed in their shields. They’ve raised tens of thousands of dollars for the Make-A-Wish Foundation, to fight diabetes and Alzheimer’s disease, and even to help out individual families in tight spots around the holidays. On top of that, Pentis and his friends have made a point of giving to CHLA every year. The men all pay their own expenses, so 100 percent of what they raise goes to the causes. In other words, they’re living the definition of Coach Wooden’s idea of success. Next year will be the last for CRFC—age has taken its toll, and the group’s four-race-a-year schedule has already been cut back to one or two. In 2019, the six will raise money with a jungle race in Vietnam and another under the pyramids in Egypt before retiring their nonprofit for good. Pentis will continue to raise money for charities solo as part of his own, new nonprofit. But they’ll always be able to appreciate what they’ve accomplished with a visit to CHLA, where the money they raised went to refurbishing a family room for patients’ relatives. And, of course, they’ll always have the memories. Inspired to help our kids just like Randy did? Consider making a donation to Children's Hospital Los Angeles at CHLA.org/Donate.